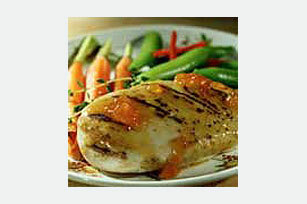 Create a delicious honey Dijon chicken dish with apricot preserves, ginger and Dijon mustard. Our Apricot-Honey Dijon Chicken is anything but ordinary! Reserve half the mustard mixture for later use. Brush chicken with remaining mustard mixture. Grill chicken 6 to 8 min. on each side or until done (165°F), brushing occasionally with reserved mustard mixture. Prepare using 1 cup plus 2 Tbsp. mustard, 3/4 cup apricot preserves, 6 Tbsp. honey, 1 Tbsp. ground ginger and 24 small boneless skinless chicken breasts (6 lb.). Makes 24 servings. Omit honey. Prepare using GREY POUPON Savory Honey Mustard.